What Will I Learn in My Bachelor’s in Accounting Program? Are you interested in a lucrative, fast-growing career where you can help manage and oversee finances? If so, you may be interested in an online bachelor’s degree in accounting. 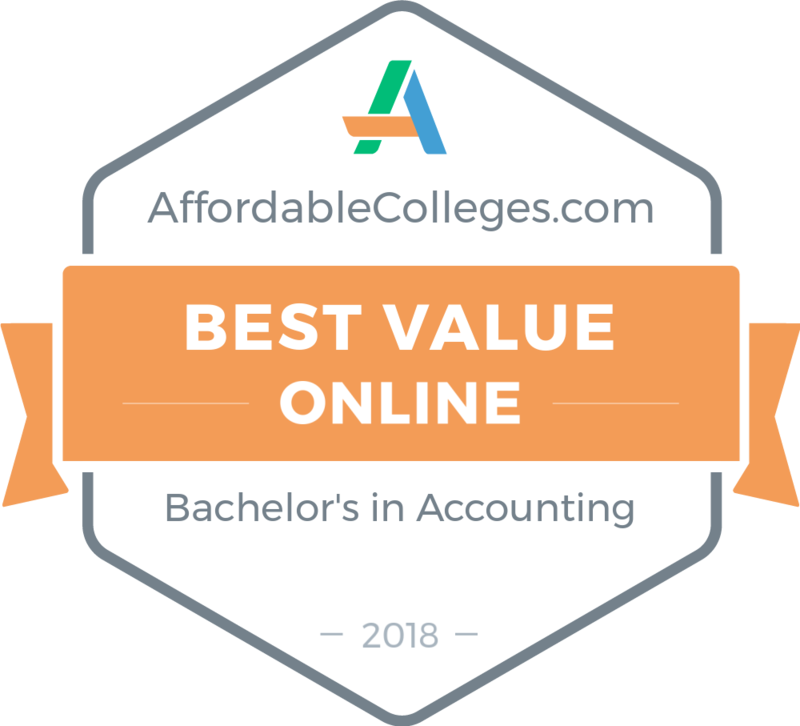 An affordable program from the top online schools for accounting can lead to a career as a fraud investigator, auditor, certified public accountant, budget analyst, or financial examiner. Following graduation, the average starting salary for recent accounting graduates is $51,310, higher than the average business major. Plus, the field is growing at 11%, outpacing the national average of 9%. An online bachelor’s degree in accounting requires a good head for math, an engaging personality, and the highest ethical standards. Nearly all entry-level finance jobs require a bachelor’s degree, and additional education may be necessary for financial management positions. How Long Does it Take to Get a Bachelor’s in Accounting? A bachelor’s degree in accounting generally requires four years of full-time study. Credit Hours In order to complete the required 120 credits for a bachelor’s degree in accounting, full-time students must pass 30 credits per year. The University of Massachusetts Amherst is the flagship institution of the University of Massachusetts system and is also one of the top public schools in the nation. Located in historic Pioneer Valley, this massive institution established its Continuing and Professional Education division in an effort to provide non-traditional access to its famous programming. UMass Amherst now offers a variety of degrees available entirely via the web, including an online bachelor's in accounting. The university's Isenberg School of Management hosts a degree-completion bachelor of business administration in accounting program that emphasizes decision-making and problem-solving, teaching students not only how to crunch data but also how best to interpret it. In addition to the basics of accounting, program participants are exposed to all aspects of business -- from finance and information management to marketing and operations -- to prepare them for careers in leadership roles. The curriculum requires 120 credits to graduate and at least 12 liberal arts credits, 20 business courses, and 21 electives. Most classes are delivered asynchronously, and there are no on-site requirements. Applicants may take up to five courses before they're even accepted into the program. All online students pay the same tuition rate. The brainchild of the governors of 19 Western states, WGU was created to offer educational opportunities to working adults, and today it's considered one of the nation's best online schools. This non-profit university exists entirely on the internet -- there is no campus, just administrative offices in Salt Lake City. WGU offers a cheap accounting degree online aimed at working bookkeepers who require academic credentials, undergraduates aspiring to an accounting career, and degree-completion students with prior college credits. The school's 121-credit bachelor of science in accounting program was developed with the input of experts and business leaders, and takes students through topics like the business of IT, human resources, marketing, quantitative analysis, finance, and business law and ethics. WGU's policy of competency-based education assesses students not by how many hours they sit in a classroom but by what they know, and program participants can test out of many courses based on prior knowledge. Most courses are delivered asynchronously. On average, learners graduate in two and a half years. Tuition is kept low at WGU -- the university hasn't raised fees since 2008. A small Catholic school located outside of Bismarck, North Dakota, the University of Mary was an early adopter of internet-based education. This Benedictine institution has offered a wide array of degree programs for working adults via the web for decades, and the school boasts a reputation for being one of the least expensive private universities in the nation. UM's affordable online accounting degree is open to people of all faiths, and the school's bachelor of science in accounting emphasizes preparation for the Certified Public Accountant exam. The program also explores standards for audits, IRS regulations, and reporting requirements for the SEC. The University of Mary prides itself on its flexibility and its online BS in accounting presents students with a variety of options. Offered entirely online, this program can be completed in three years on an accelerated schedule. Many participants use the program as the first part of their MBA while others take a five-year option, graduating with a master's in accounting and finishing most of the prep for the CPA. A minor in business administration is also popular. Year round classes start every five weeks. Established in 1836 as a tiny extension school, the University of Alabama at Birmingham has grown into an educational colossus all of its own. Today the school serves more than 19,000 students, hosts extensive research capabilities, and boasts a thriving virtual campus. UAB's online bachelor's degree in accounting steeps students in the "language of business," taking learners through every aspect of accounting, from information technology and financial literacy to management and communication. An undergraduate degree at UAB requires the completion of 120 credits, and the Collat School of Business's nationally ranked bachelor of science in accounting program curriculum itself requires 48 credits to complete. Accredited by the prestigious AASCB, and endorsed by the Institute of Management Accountants for successful CMA preparation, the entire program may be pursued online with no visits to Birmingham necessary. Most classes are asynchronous, and students typically take four years to graduate. Collat also offers minors in management, human resource management, and business administration online (which could be used to enhance an accounting student's profile, for example). Admission requires a high school transcript and scores from the SAT or ACT exam. Based in Midland, Michigan, Northwood University Texas serves students at locations across the country, and offers a cheap online bachelor's in accounting program from its Texas location. The school's bachelor of business administration: accounting program is an offshoot of the school's traditional BBA degree, and includes a wide range of management courses. Many students use the program as the first component of an MBA, and the school offers an accelerated option in which participants can earn their bachelor's in three years and their master's in four. Unlike many accounting programs where students complete semesters of general education before taking their first accounting class, this course places students into fundamentals of financial accounting in the first semester of their freshmen year. The entire program requires the completion of 123 credits to graduate, and every term includes courses in number crunching, management, taxation, or related business class. The school also offers a minor in operations and supply chain management. Tuition is the same for all students with the exception of active duty military, who enjoy large discounts. Few online bachelor's in accounting programs are as affordable as Georgia Southwestern State's. E-tuition fees at the four-year public school in Americus are less than half of those at many other universities. And the quality certainly doesn't suffer -- GSW's bachelor of business administration: accounting degree program degree is fully accredited by the elite AACSB. Built around the school's BBA program, curriculum teaches students managerial skills and surveys topics such as accounting principles, taxation, audits, data analysis, and information systems. To graduate, students must accrue 120 credits, which are split in half between general education and major requirements. Most classes are taught asynchronously, and a C average or better must be maintained for the major core. Students enrolling on GSW's virtual campus must complete an online orientation before registering for classes. Program participants with college experience -- or work experience -- may earn transfer credits through the university's Prior Learning Assessment program. Students must live 50 miles or more from the university to be eligible for this program. A small Catholic institution in the Franciscan tradition, Viterbo is one of the top regional universities in the Midwest. The La Crosse, Wisconsin university hosts a number of its acclaimed programs on the web, including its affordable online bachelor's in accounting program. Viterbo's bachelor of science in accounting program is most suitable for students who already hold an associate degree or who have completed two-years of college-level coursework. Prerequisite classes include accounting I and II, taxation, cost accounting, business law, economics, and a computer course that covers accounting information systems and MS Office. By graduation, learners will have completed much of the preparation needed to sit for the CPA exam. Morehead State University's online bachelor's in accounting program is an extension of the school's bachelor's in business administration. Based in Morehead, Kentucky, MSU's program is a degree-completion offering, meaning that applicants will already have typically completed most of the lower-level coursework needed for graduation. Some learners enter the program with an associate degree, whereas others have completed an equivalent sum of college courses. The school's bachelor of business administration: accounting curriculum consists of 60 credits, generally taken over the course of two years. Most classes are asynchronous, though some professors will require occasional real-time meetings. Some exams may require proctoring. Admission requires students to meet general MSU standards for admission -- a high school diploma or GED, SAT, or ACT scores -- as well as student completion of core business prerequisites with a GPA of at least 2.25. Some students may be admitted on a conditional basis. Online learners pay the Kentucky resident rate for tuition. Located in its namesake Nebraska town, Bellevue University has educated adult learners since its founding in 1966. Today Bellevue hosts an affordable online bachelor's in accounting program that can be pursued entirely via the web. Students in the school's bachelor of science in accounting program enjoy a hands-on interactive experience that readies them for professional accounting positions and prepares them to sit for the Certified Public Accountant exam. The school also offers a minor in taxes, allowing students to further polish their CV. Bellevue's curriculum is composed of 36 general education credits, ten elective credits, 72 major credits, and nine credits dedicated to the school's unique Kirkman Signature Series. The school delivers coursework asynchronously, and mandates no residency requirements. An optional internship gives students the opportunity to try new skills and gain practical experience. Bellevue's online student tuition rates are significantly higher than on-campus tuition rates. Considered one of the best small public baccalaureate colleges in the Midwest, NSU offers remarkably affordable online accounting degrees. Located in Aberdeen, South Dakota, the university charges a highly attractive tuition rate for its web-based programs, and non-residents pay the same as residents. The school hosts two undergraduate accounting degrees -- a bachelor of science in accounting and a bachelor of science in professional accountancy, aimed at students who intend to sit for the CPA exam. The curriculum for the two programs is similar, and both require 46 core business credits and passage of the School of Business exit exam to qualify for graduation. The professional accountancy program has more program requirements, however, requiring twice as many credits for completion. Most of these credits come from specialty classes like advanced income tax, accounting theory, accounting systems, and internal auditing. The total moves students closer to the 150 credits needed to take the CPA exam. Students pursuing business degrees at NSU are eligible for business scholarships. Internships are available, and program participants are welcome to join the NSU Accounting Club, where networking opportunities await. A national leader in internet-based education, Saint Leo University is set in the sunny Florida town of the same name. A Catholic liberal-arts institution open to all faiths, the university offers more than 40 degree programs on its virtual campus, including a cheap online accounting degree. The school's bachelor of arts in accounting program equips students with the skills they need to enter the world of accounting at the entry level (whether as part of a corporation, nonprofit, or government office) while also providing learners with a broad base from which to consider taking the CMA or CPA exams. Accredited by the International Assembly for Collegiate Business Education (IACBE), the curriculum guide participants through all facets of modern accountancy, including basic fundamentals and concepts, cost accounting, auditing, taxes, and business law. Students must also take nine credits worth of classes in religion and spirituality. A total of 120 credits are needed to earn a BA from Saint Leo, and students usually take four years to complete the program. Coursework is the same online and on-campus, much of which is delivered asynchronously -- allowing students to log in at any time. The university features a series of self-paced tutorials that guide online learners through the virtual classroom. A liberal arts university affiliated with the Disciples of Christ and Christian Churches/Churches of Christ, Northwest Christian University in Eugene, Oregon has almost 800 students, including those enrolled in the online Adult Degree Program. The idea is simple -- give working adults an opportunity to advance their lives and careers without needing to quit their jobs. Accounting is one of the most popular majors for students enrolled in NCU’s online Adult Degree Program. NCU’s online accounting degree is designed for entry-level students in accounting and management, and includes not only courses on number-crunching, but many in business administration as well. The school's bachelor of science in accounting consists of an 18-class program that covers topics such as the essential principles of accounting, and micro- and macroeconomics. The curriculum culminates in a capstone project that explores the SEC, foreign transactions, and consolidation accounting, among other specialized topics. All program participants are expected to minor in business, and many choose to pursue an internship to acquire real-world experience. The school awards transfer credits for college classes completed as well as prior work experience. Classes are scheduled in accelerated, eight-week sessions, year round. Founded in 1964, Florida Atlantic was the first American university to exclusively provide upper-division education. Today, FAU continues that mission, using the internet as one of many tools to deliver its programming to working adults. This Boca Raton-based institution offers an online accounting degree that is essentially the back half of a traditional undergraduate education. Students are expected to enter Florida Atlantic's bachelor of business administration in accounting program with at least 60 credits, and must pass the Accounting Competency Exam before registering for their first classes. Program participants follow the same rigorous curriculum taught in Florida classrooms, and they must accrue 51 to 60 credits while maintaining a C average to earn their degrees. The program can be completed entirely via the web, and classes are offered both asynchronously and real-time. Admissions are rolling, and students may start any term. Tuition is three times more expensive for students outside of Florida. Concordia University Saint Paul is one of ten schools that make up the Concordia University System of the Lutheran Church. Boasting a vibrant virtual campus, this private, four-year, Minnesota institution hosts dozens of degree programs in its cyber classrooms, including an affordable bachelor's in accounting online program. The school's bachelor of arts in accounting is offered in a blended format that requires some time on campus, and it includes only 40 of the 120 credits needed for graduation. Students get a broad overview of accountancy, and learn to gather, record, and analyze financial data -- and communicate it to others -- as they build a strong foundation in preparation for the professional accounting exams. Classes are scheduled in fast, seven-week terms, and most are asynchronous. Applicants should submit transcripts from whatever college-level courses they have completed. Those with no undergraduate experience must send their high school transcripts and ACT or SAT scores. Everyone must include a 600-word personal essay on why they are seeking a degree and their personal goals. Tuition is the same regardless of location. More than 90% of graduates are employed after leaving Concordia. One of the nation's largest institutions, Temple University is a leading provider of professional education. The Philadelphia-based institution's Fox School of Business hosts an online bachelor's in accounting that explores the conceptual framework of accountancy, from asset management and liabilities to owner's equity and financial reporting. The curriculum of the bachelor of business administration: accounting program covers cost analysis and control, taxation, ethics, auditing theory, and accounting information systems. Students are also required to take classes outside of the major on topics such as the legal and social environment of business, the social sciences, and written and oral communication. The program is accredited by the standard-setting AACSB, and may be pursued part time or full time. Students must accrue 120 credits to graduate, including the 45 Temple requires in general education. All classes are scheduled synchronously, requiring students to be online at meeting times, fostering a spirit of teamwork and collaboration between classmates. Several professional accounting organizations have chapters at Temple, and students are encouraged to join for networking opportunities. Online learners play a single flat rate no matter where they're from. When Davenport University was founded just after the Civil War, bookkeeping was one of the first disciplines taught. These days the small, private, nonprofit school in Grand Rapids, Michigan, continues the accounting tradition via the web, with its online bachelor's in accounting. The bachelor of business administration in accounting program gives students the well-rounded business background of a BBA as well as a thorough understanding of the precepts of accountancy. Students learn leadership, communication, and critical thinking skills along with an understanding of how to use accounting as a decision-making tool. Generally Accepted Accounting Principles (GAAP) and International Accounting Standards are also taught. Students have the option of specializing in management accounting or internal auditing once they've completed their core courses. A total of 120 credits are needed to graduate, and students are required to take 39 in general education, 32 in the foundations of business, and 45 in the major. The rest come in the form of electives. Either a field internship or a capstone project must be completed. Most coursework can be undertaken in an asynchronous fashion, but some professors use real-time components. Online learners from out of state pay a reduced tuition rate. A comprehensive, evangelical Christian university, Indiana Wesleyan University offers one of the most extensive virtual campuses in the nation. This Marion-based school offers almost 100 degree programs via the web, from the associate to doctoral level. Among them is an affordable online bachelor's in accounting program designed for working professionals. IWU-Marion's bachelor of science in accounting program emphasizes accounting theory, taxation, and auditing and provides students with a platform from which to consider the CPA exam. This cohort-based program consists of 16 classes that are typically taken sequentially, one at a time, allowing students to complete the program in 18 to 20 months. A bachelor's from IWU requires 120 credits, which includes 30 liberal arts credits, completion of the major core, and electives. Students can earn up to 40 credits through the Prior Learning Assessment program and tuition is the same online or in-seat. Applicants must submit proof of high school diploma or GED, and previous college transcripts. Degree completion learners must have amassed 60 transferable credits from an accredited college. Founded in 1828, McKendree was the first institution of higher learning in Illinois. Today, the Lebanon-based school is among the most forward-thinking universities in the state, offering a full slate of programs on its internet campus. McKendree is known for small class sizes and personal attention -- class size is on average 14 students -- and it brings that close-knit feel to its web offerings. Students in the university's bachelor of business administration: accounting program can expect to get to know their classmates -- and their professors -- as they work their way through courses covering subjects such as taxation of individuals, business ethics, and accounting information systems. The curriculum of the school's cheap online accounting degree program is divided between 40 hours of upper levels required for the major and a general education remainder. Students typically take two courses during each of the eight week, accelerated terms, on their way to accruing the 120 credits needed to graduate. Up to 96 credits may be transferred in. At least 32 credits need to be earned from McKendree. At Denver's Regis University, online students have options. This private Jesuit institution's World Campus hosts dozens of web-based degree programs and provides access to thousands more courses through the Online Consortium of Independent Colleges and Universities. Students interested in a bachelor's in accounting online program can add a minor in, say, finance or marketing, or earn a certificate of completion in a related field like leadership, conflict management, project management, or public administration to add more credentials to their degree. Ambitious students can also accrue credits toward a master's while enrolled in the school's bachelor of science in accounting program, earning two degrees faster and cheaper. An undergraduate degree at Regis requires 128 credits, including 45 in general education. The major itself requires 57 more and the remainder are earned in electives. Courses are offered in five- and eight-week formats and no campus visits are necessary. The university's partnership with Becker CPA Review courses provides students with a deep discount in preparing for the CPA exam. Applicants must have prior college experience to enroll in the program. A private, nonprofit university with campuses across Florida, Keiser was founded as a career college in 1977. Today the Fort Lauderdale-based school administers one of the most extensive catalogs of internet degrees in the nation. Among Keiser's wealth of web-based offerings is a cheap online bachelor's in accounting program that can be pursued entirely via the web. This bachelor of arts in accounting provides students with the unique skills needed to succeed in the modern world of business. The curriculum explores taxation, auditing, cost analysis, and accounting information systems, while giving students a background in critical business skills like decision making, ethics, and communication. To be eligible for many of the program's major courses, student must have completed micro and macroeconomics and statistics. Baccalaureate degrees at Keiser require completion of 120 credits, and they are divided between lower-division accounting courses (24), general education (45), and upper division major courses (51). Students must maintain a grade of C or better in principle classes. Coursework is completed asynchronously, for the most part, and students typically take one course at a time in an accelerated format. Classes start every month. With more than 110,000 students enrolled, Liberty University is the nation’s largest non-profit, private university. This Lynchburg, Virginia-based evangelical institution has done most of its growth on the web and today over 80,000 of its students attend courses at Liberty's virtual campus. The university offers an affordable online accounting degree that examines the language of business from a Christian perspective. In Liberty's bachelor of science in accounting program, students learn from experts in the field, learning not only the basics of number crunching but how to read, analyze, and interpret data. The curriculum is split in half between general education and major requirements, and at least 30 of the program's required 120 required credits must be earned through Liberty. The school requires that three courses -- or 12 hours -- are taken in Christian education. Coursework is asynchronous and may be pursued entirely online. Internships are strongly recommended. Applicants must have a 2.0 GPA or better on high school or previous college work. Online students benefit from access to the Liberty Online Writing Center, online tutorials, and career services. WSU considers its online Global Campus an extension of its 1890 land-grant promise to expand access to education. Based in Pullman, Washington, this large, public university administers a diverse array of programs at its internet campus, including the school's online accounting degree program. The school's bachelor of arts in accounting program is accredited by the AACSB, a premier business accrediting agency, and all courses are available digitally. The core curriculum delves into financial management, auditing, taxation, and business strategy, and the school places a particular emphasis on encouraging innovation. The program is designed for part-time attendance, allowing busy students to continue their careers. Most of classes sponsored by WSU's Carson College of Business are scheduled in accelerated, eight-week sessions. Other coursework, however, follows the university's traditional 16-week semester. Students must complete general education requisites, business core classes, accounting major requirements, accounting electives, Carson requirements, and a mandatory international experience, which can be a study abroad opportunity or classwork. A total of 120 credits are needed before students can take home a diploma. Clarion University of Pennsylvania's online accounting degree is divided into two tracks -- a CPA concentration and an industry concentration. Located in bucolic Clarion, Pennsylvania, this small public university splits its bachelor of science in business administration: accounting program this way so that students can tailor it to their area of interest. Those intending to continue their education and sit for the certified public accountant exam will want the CPA specialization. Those who with aspirations to enter the corporate world as an accountant will prefer the industry track. All graduates of the program will be able to analyze data, use current accounting technologies, understand trends in business, and demonstrate competence not only in accounting but also in subjects such as economics, finance, marketing, and management. Students in the accounting program are required to complete 48 general education credits and at least 24 credits in their major. The program requires learners to complete a total of 120 credits for graduation. The CPA track requires nine more credits than the industry track. Most courses are asynchronous, but some may feature real-time components. Online learners pay a slightly higher tuition than in-state residents. For a small campus of the University of Minnesota system, UMC has a large internet presence. Based in the tiny city of Crookston, this comprehensive public university offers more than a dozen baccalaureate degrees and certificates via the web, and has been at it a long time -- over 20 years, in fact. The school's affordable online bachelor's degree in accounting program teaches students everything they need to know to work with financial reports at the corporate, nonprofit, or government levels. One feature that sets Crookston's bachelor of science in accounting program apart is that students can take professional certification examinations (CPA, CMA, or CIA) on campus without having to continue on to a master's program. The 120-credit curriculum calls for students to complete 63 credits in the accounting major ara. All classes can be taken asynchronously for maximum flexibility. A certificate in taxation and minors in communication, entrepreneurship, finance, international business, management, and marketing can all be added to the program to enhance a student's CV. According to the school, more than 90% of graduates find work in their field after leaving UMC. Established in 1905 and affiliated with the Cooperative Baptist Fellowship, Gardner-Webb is a comprehensive Christian university with more than 60 undergraduate degree programs and a strong virtual campus. The school offers a cheap online bachelor's in accounting program from its home in Boiling Springs, North Carolina. Gardner-Webb's bachelor of arts in accounting is a degree-completion program that combines the broad base of a business administration degree with a focus on the language of business. Enrollees learn accounting best practices and an array of quantitative techniques and problem solving skills. Students in the program must meet the university's general education requirements and amass 60 credits in the major, at least half of which must be completed through Gardner-Webb. A total of 120 credits are needed to earn a diploma. Degree completion students must have obtained 48 previous college credits. Learners from California, Massachusetts, Florida, and New Jersey are not eligible due to state regulations. One of the nation's leading universities, Penn State offered distance learning as far back as 1892, and the institution has continued to hone their approach ever since. The school's online arm is known as the Penn State World Campus, and it now provides access to more than 120 degree program to anyone who has a computer and an internet connection. The school's online accounting bachelor's program is accredited by the prestigious AACSB and follows a comprehensive curriculum designed to ready students for the CPA exam (or any of the other major professional accounting certifications). Penn State's bachelor of science in accounting is a 120-credit program -- half general education, half major focus -- that explores the intersection of accounting and the world of business. Early coursework takes students through finance, business strategy, business law, and marketing, while later studies focus more on an individual's career aspirations. A finance minor is available. Most classes are asynchronous and run for 12 to 15 weeks, allowing students to complete their degree within four years. Applicants must have completed high school or earned their GED. Part of Oklahoma's system of public universities, Northwestern operates a very small online arm, offering just a few degree programs. But what it does, it does well. Located in the city of Alva, the university hosts a bachelor of science in accounting program that allows students to finish their undergraduate degree from the comfort of their own homes. All courses necessary to complete the major component of this online accounting bachelor's may be taken via the web, but some general education classes may need to be completed at a local community college. The curriculum includes mostly asynchronous classes, except for business policy, which is taken during a student's last semester and has set meeting times. Each course follows the traditional semester and has a major proctored exam. All participants must take the school's online program orientation class early into their program. The university does not limit the number of transferable classes, but it does require that at least 30 credits toward the online accounting degree be earned at Northwestern. Many web-based learners are eligible for the school's NWOSU GO OK! tuition waiver, which reduces fees close to the school's cheap, in-state rate. From its home in sunny southern California, CBU offers some of the most dynamic online programs to be found. This private, Christian, liberal-arts institution hosts more than 40 market-driven, web-based degrees, and utilizes the latest in technology. These include an online bachelor's in accounting optimized to prepare students for the CPA exam and careers in public, corporate, or nonprofit accounting. The program takes a "Biblical approach to accounting" and features a 100% Christian faculty. Accredited by the elite ACBSP, the bachelor of science in accounting curriculum requires completion of 69 units, split into 18 units of lower-division core courses, 24 units of upper-division core classes, and 24 upper-division accounting units. Most coursework is delivered asynchronously, and classes start every eight weeks, year-round. Participants have the option of doing an internship, to gain practical, hands-on experience, or to explore the global economy by traveling to Oxford, England, for a two-week summer program. Online learners pay a flat-rate of tuition. Part of the Minnesota State Colleges and Universities System, Bemidji State University offers more than 65 undergraduate and pre-professional programs from its location on the shores of scenic Lake Bemidji. The school has long pursued its mission of providing access to education in underserved areas, and it continues its mission today with a host of internet-based degree options. BSU's affordable online accounting degree is a 71-unit, degree-completion program that requires students to hold at least an associate's degree or to have completed a commensurate number of credits. From acceptance to graduation, the program can be finished in two years -- if students transfer the appropriate number of credits. The school's bachelor of science in accounting program adheres to the same 120-credit standard as many traditional baccalaureate degrees. Bemidji has designed its curriculum to fit two-, three-, or four-year plans, and students may take as few as one course per semester, generally in an asynchronous format. No on-site visits are necessary. Thirty credits must be earned through the university itself. A minor in fraud examination may be added to create a unique specialty. Brescia University considers its online accounting degree a "destination program" -- in other words, the program is well known enough that it attracts a following to this small Catholic university in Owensboro, Kentucky. Anyone can enroll in the program from their home office, thanks to the school's web campus. Brescia's bachelor of science in accounting gives students a background not just in number crunching but in broader business practices. The school's 100% online curriculum is tailored for adult learners, enabling them to complete their baccalaureate studies in two years or less. Coursework was designed to accommodate a professional's busy schedule, and classes are asynchronous. Brescia requires 128 credits to earn a bachelor's, and a maximum of 86 credits may be transferred in. Lower-level classes are available through the university's own associate of arts through its liberal arts program. Tuition is the same regardless of location. The school hosts a demo version of its online courses at its site. Based in Wilkes Barre, Pennsylvania, Misericordia University is a Catholic institution that has offered adult and continuing education for almost a century. This small, private liberal arts institution offers a fast-paced online accounting program that lets students earn their undergraduate degree in less than two and a half years. This bachelor of science in accounting program is inspired by the American Institute of Certified Public Accountant's idea that to better create a well-rounded accountant, an accounting education should include a healthy dose of the liberal arts and broader business skills. The school's Expressway accelerated degree program allows students to earn up to 12 credits per semester in seven-week sessions. The program was designed for learners who have prior college credits -- or professional work experience -- and has eight different start dates throughout the year. Applicants should have a minimum of 15 college credits and a GPA of 2.0 or better, and a record of high school success. Accreditation is through the International Assembly for Collegiate Business Education. The University of West Alabama has committed so fully to online education that it now has more students in its cyber classrooms than it does at its physical campus in Livingston, Alabama. This small public university hosts dozens of online options, from certificate programs to master's degrees. UWA's bachelor of business administration in accounting is centered around the BBA curriculum, and develops management, decision-making, and finance skills as well as the precepts of accounting. The curriculum requires students to finish all 30 credits of the school's Business Professional Component, a basic, liberal arts track mixed with business administration courses. Comprised of classes covering courses such as intermediate accounting, computer-based accounting systems, and federal income tax, the accounting major only accounts for 30 credits of the 120 total needed for a bachelor's at UWA. Many students choose to take the Volunteer Income Tax Assistance practicum, an internship that provides hands-on, tax-prep experience. Coursework is delivered largely asynchronously and the program follows an accelerated eight-week schedule across six terms a year. The average participant earns their degree in about 18 months. A non-profit institution located in Midland, Michigan, Northwood is part of the larger Northwood University chain, a conservative educational empire that has centers in Florida, Texas, and online. NWU's bachelor of business administration: accounting program is built around the school's traditional BBA, and it features an array of management courses. Many students use the online accounting degree as a launching pad for their MBA, and the school offers an accelerated plan that allows participants to earn their bachelor's in just three years -- and their master's in four. Northwood's mission is to champion the U.S. market-based system and the curriculum requires students to take classes like philosophy of American enterprise. Unlike many programs that attach a handful of accounting classes onto the end of a student's university career, learners at NWU being courses in their major from their very first semester. Every term thereafter includes courses in the language of business, management, taxation or related business. Accredited by the ACBSP, this 123-credit degree can be pursued entirely via the web. Tuition is the same for all students (except active duty military who enjoy discounts). All of the classes in Belhaven University's bachelor of science in accounting program integrate the Mississippi university's Christian philosophy. Not only are students at the private, Jackson-based school required to take courses on topics such as the Old Testament history but core courses focused on topics like computerized accounting and accounting for business taxes are infused with the school's Biblical perspective. This 124-credit curriculum provides students with a broad overview of accounting tenets -- including all the requirements necessary to take the CPA exam in Mississippi -- while placing a particular emphasis on ethics in the field. Classes in Belhaven's affordable online accounting degree program are highly flexible, but also feature a regular schedule. Coursework is delivered asynchronously, but students are expected to post a 250-word text every Wednesday and follow it up with two more 125-word pieces by the end of the week. Other assignments are due on Saturday. Online undergraduate programs are designed to be completed within four years, and the program features no on-campus requirements. Serving career-oriented programs to adult learners is at the heart of Peirce College's mission. This small, private, nonprofit institution got its start as a business school in 1865, and continues to provide affordable education to adults both on its campus in Central City, Philadelphia, and online. Peirce's online bachelor's in accounting emphasizes analytical and financial skills and fulfills the core class requirements of the CPA exam. The bachelor of science in accounting program is accredited by the standard-setting ACBSP, and is composed of 121 credits. 26 classes comprise the major core, beginning with PRC100, a one-credit orientation class, and culminating with a capstone or internship. Peirce subscribes to competency-based education, which places a premium on past experience and allows students to move at their own pace and test out of many requirements. All class components can be found online and are delivered asynchronously. Tuition is the same for all students no matter where they study or where they're from. Applicants take a college-placement exam at Peirce (this can be waived with ACT or SAT scores). Granite State occupies its own niche in the New Hampshire university system -- unlike the state's other public schools, it was specifically designed to meet the needs of adult and non-traditional learners. The average age of undergrads at Granite State is 34, and more than 75% attend at least some of their classes online. GSC offers an affordable online bachelor's in accounting perfectly suited to the college's audience. Created to fit around a busy professional's schedule, the school's bachelor of science in accounting and finance program teaches students not only how to speak the language of business but how to manage investments, maximize assets, and gain efficiencies. And it also provides much of the framework they need to sit for a professional accounting exam. The vast majority of coursework can be pursued entirely online, though a couple of visits to the Concord campus may be necessary. Most students in the program -- 84% -- are transfers, and the school optimizes transfer credit, recognizing the educational benefits of skills learned in the military, on the job, or volunteering. Online students pay only slightly more than New Hampshire residents. Admission is on a rolling basis, allowing enrolled learners to jump in at any time. Metropolitan State University of Denver is a large, urban, public institution in a historic Denver neighborhood, and it has become known for the quality of its business programs. One of 5% of business schools accredited by the AACSB, the university now offers much of its programming via the web, including all of its general-education requirements and an online degree in accounting. MSU Denver's bachelor of science in accounting program offers only 24 credits worth of major courses, which amounts to just eight classes. The university has a unique 3+2 opportunity available to students in its accounting program -- accepted participants can take graduate-level courses while undergrads, and bring home both a bachelor's and a master of professional accountancy degree in five years. This is a particularly attractive option to those aspiring accountants who want to sit for the CPA exam, which requires 30 more credits than the 120 needed for a bachelor's. Most classes are taken asynchronously, and participants can select 22 week or six-month sessions. The University of the Incarnate Word's online accounting degree program is an extension of the San Antonio institution's undergraduate business administration program. As such, students can expect to learn accounting and management in equal measures. One of Texas's top Catholic universities, UIW modeled its accountancy curriculum on the American Institute of Certified Public Accountant's core competencies, and it presents accounting as the means by which corporations report to their stakeholders. Students learn to read and interpret data, track changes in equities, develop their own decision making, and communicate effectively -- all while picking up invaluable leadership skills. Coursework in this bachelor of science in business administration: accounting program includes 18 credits in intermediate accounting, cost accounting, federal income taxes, and auditing, and -- in keeping with the mission of the founding Sisters of Charity -- students must volunteer for at least 45 hours to graduate. A total of 120 credits are needed to earn a diploma. Classes are scheduled in eight-week terms, six times per year, and the degree can be pursued 100% via the web. Online students pay more than on-campus students for tuition. Indiana State is continually ranked as one of the top public universities in the Midwest, and it has one of the nation's best online accounting degrees. What makes the Terre Haute institution's program unique is the opportunity it presents to customize a bachelor's in accounting with uncommon minors like forensic accounting, sustainability, and Lean Six Sigma. The program is also exceptional at preparing students to sit for the CPA exam or for those individuals interested in pursuing a master's in the field. The curriculum of the school's bachelor of science in accounting is identical to its on-campus counterpart and provides students with a foundation of general knowledge, core business practices, and in-depth accounting theory and practice. It accounts for 72 credits of the 120 credits needed to earn a diploma. All classes can be taken online and no visits to Terre Haute are necessary. Most courses are asynchronous, and 24/7 tech support is available. Non-resident online students pay significantly less than on-campus learners. Alaska Pacific University's online accounting degree program features an accounting minor built into a specialized undergraduate management program, providing students with a wide range of skills necessary for the modern business world. The IACBE-accredited program offered by the tiny Fairbanks institution takes a very hands-on approach, exploring leadership, values and ethics, organizational change, communications, teamwork, and finance. Because the program features two major tracks -- healthcare management or nonprofit management -- it's most appropriate for aspiring accountants who envision a career outside of the corporate sphere. Small cohorts are at the heart of this bachelor of arts in business administration and management. Students go through the program in small, close-knit teams, providing an opportunity to gain new perspectives, collaborate on projects, and create networks. Coursework is delivered asynchronously and in an accelerated format, making it possible to graduate in four years while maintaining a job. Admissions requires a high school diploma with an average GPA of 2.5 or better (or a GED), and SAT or ACT scores. Franklin University was founded in 1902 to create a pathway to education for adults and non-traditional learners. Since then, the non-profit institution has grown into the second-largest private university in Ohio and maintains its reputation as a quiet pioneer in online education. Anything that the school offers on its Columbus campus can be earned via the web, including online degrees in accounting. Franklin hosts several undergraduate programs of interest to aspiring accountants including its traditional bachelor of science in accounting, a BS in forensic accounting, and four year degrees in financial planning, financial management, business economics, information systems auditing, and business administration -- all of which can be customized with a minor in accounting. Franklin's baccalaureate degrees require 124 credits to graduate. Classes are scheduled asynchronously and can be taken in six-, 12-, or 15-week sessions. Multiple start dates add to flexibility. The university offers a liberal transfer credit policy and its website hosts a helpful transfer tool to help potential applicants figure out how many of their credits will likely be accepted. Auburn's University aims its online bachelor's in accounting at professionals who have decided to switch careers. At the Auburn, Alabama, public research university, the web-based bachelor of science in accounting program is offered as a degree-completion program, and students are expected to be working professionals holding an AACSB-accredited bachelor's or master's degree in business. Anyone with those credentials can earn their BS in accounting and build a foundation from which to take the CPA exam in only 30 semester hours while working full-time. The online program runs parallel to the on-campus one, and students view the same lectures and complete the same assignments -- only asynchronously. The curriculum includes required classes covering topics such as intermediate accounting, cost accounting, income tax, and advanced business law. Most students take six credits per semester, allowing them to finish within five semesters. Exams are proctored at a prearranged site. Distance learners benefit from access to all of the same facilities and services as students on campus. Auburn also offers an online accounting bridge program, which provides all the credits necessary to sit for the CPA, as well as an undergraduate certificate in accounting. A small, private, regional educational institution, Trine University administers an extensive College of Graduate Professional Studies, giving adults an opportunity to finish their college degree. The school's online bachelor's in accounting is an experiential-learning program where students get hands-on, practical experience working both in and out of the virtual classroom. Program participants work the books in real companies, become well-acquainted with accounting applications like Peachtree and QuickBooks, and earn most of the credits they need to sit for professional accounting exams. The ACBSP-accredited curriculum of the school's bachelor of science in business administration major in accounting program requires the completion of 120 credits -- 42 in general education, 30 in the business core, 33 in accounting itself, and 15 in electives. Classes are asynchronous and offered in eight-week terms. Trine accepts up to 89 transfer credits, though students must have maintained a C or higher on all classes, and will also consider credit for work experience. There are no on-site requirements. All online undergraduates pay the same tuition. Saint Joseph's College is a small, private, liberal arts school with an emphasis on career-oriented education. Founded in 1912 by the Sisters of Mercy, the school now boasts two and half times as many students enrolled online than at its scenic campus on the shores of Sebago Lake in Standish, Maine. The college's virtual campus offers several undergraduate opportunities for those interested in accountancy, including a bachelor of business administration with a major in accounting, an interdisciplinary major with an accounting minor, and a fast track program to an MBA open to any major. The curriculum of the bachelor of administration with a major in accounting features a broad appeal, optimized for small business owners, potential CPAs, and future graduate students. The program was specifically designed to include all the courses required to continue on to a master's, and makes it possible for participants to earn their graduate degree in a single additional year. A total of 128 credits must be completed to graduate, 25% of which must be earned at Saint Joseph's. A commuter school in the state's capital, the University of Maine at Augusta is the third largest public campus in the Pine Tree State -- and growing. The university has expanded dramatically in the past few decades, and has experienced a great deal of success with its online programs. UMA's online accounting degree is part of its broader business administration program, and students graduate with solid managerial skills, an ability to communicate effectively, expertise in a wide range of business areas, and a strong background in accountancy. UMA requires the completion of 121 credits for its bachelor of science in business administration: accounting program, including 60 credits in the major, 52 credits in general education, and nine open electives. Students must pass a writing intensive course, complete nine credits in upper-level major courses, and maintain a 2.0 cumulative GPA. Three concentrations are available within the accounting major -- financial accounting, management accounting, and governmental accounting -- allowing participants to tailor their degree to their own interests. Students may earn credits for work experience through the school's Prior Learning Assessment. Graduates with an online bachelor’s degree in accounting enjoy careers in finance, analysis, tax preparation, and financial record management. These employees must exhibit attention to detail, high ethical standards, and superior knowledge of the field. Some accounting majors specialize in a single industry like healthcare. Others focus on particular services like risk management. Accountants can work for the public, the government, or a corporation. Organized people who enjoy numerical challenges thrive in accounting-related professions. A financial examiner reviews an organization’s documents and transactions to ensure it remains compliant with relevant laws and policies. Most of these professionals choose emphasizing either risk scoping — evaluating organizational financial health — or consumer compliance (looking out for the customer’s benefit). These professionals help businesses and households make investment decisions by providing information and guidance on wealth management vehicles. These analysts can focus on the buying or selling side, and can also focus on a particular region of the world, a specific industry, or a product. An accountant prepares an organization’s financial records and verifies their accuracy. Accountants also ensure that clients file and pay their taxes on time. They can work in the public or private sector or for the government. Some accountants become auditors who examine organizational records for financial mismanagement. Budget analysts work with program officers to develop an organization’s budget. They monitor budget compliance and institutional spending, draft budget reports, and analyze cost-benefit data. These professionals recommend budget changes while monitoring the link between expenditure and outcome. Working in banks, credit unions, and other institutions, loan officers use a process called underwriting to evaluate loan applications and recommend them for approval. Loan officers meet one-on-one with applicants to gather information and answer mortgage questions, and also solicit customers for lending companies. In accounting-related professions, entry-level positions require a bachelor’s degree. Students wishing to pursue advanced career opportunities can enroll in a master’s of accounting or an MBA in accounting. The former focuses on the technical aspects of accounting. The latter is a general business degree that includes accounting courses. While the certified public accountant, certified management accountant, and certified fraud examiner tests do not require a master’s degree, graduate education may benefit anyone who wants to take these exams. Principles of Accounting I Students learn fundamental accounting standards and concepts including inventory, present value, identification, and measurement. Government and Nonprofit Accounting This course covers governmental and nonprofit accounting practices, including budgeting, regulatory requirements, and special taxation issues. Cost Accounting Learners consider the role of cost accounting in modern economic systems, manufacturing industries, and trade. They also look at cost accounting methodologies including the QC, ABC, and LCC methods. Auditing Students learn about the role of the auditor, auditing standards, professional ethics, and an auditor’s legal liability. They also review auditing theory and practice. Corporate Taxation This explores the foundations of federal tax law and policy for corporations. It may include information on tax issues surrounding mergers and acquisitions. Accountants and auditors who hold a bachelor’s degree in accounting can find employment in any state. Urban areas with high concentrations of corporations and government agencies, however, employ more accountants than the national average. Employers in these areas also pay financial professionals a good salary of $68,150 on average. For students planning to work in these high-dollar markets, coursework in corporate tax law or government agency accounting may prove especially valuable. A bachelor’s degree in accounting can lead to several entry-level positions in finance. Often, no further certification is necessary. To earn more money and to advance professionally, accountants may choose to become CPAs or earn a related professional license. Only a CPA can prepare a reviewed or audited financial statement, and they earn between 10% and 15% more than their contemporaries. Certified Public Accountant (CPA): Requirements vary by state, but typically, CPAs must have relevant experience, hold a bachelor’s degree in accounting, and pass the CPA exam. The CPA designation allows holders to prepare audits and review financial statements. Certified Fraud Examiner (CFE): A member of the Association of Certified Fraud Examiners who holds a bachelor’s degree and meets experience requirements can sit for their CFE exam. CFEs serve as auditors, investigators, risk officers, and federal agents. Certified Management Accountant (CMA): To take the CMA exam, applicants must have a bachelor’s degree in accounting with two-plus years of professional experience. CMAs hold a variety of financial positions, and earn an average of 28% more than non-certified accounting professionals. Accreditation assures students that a higher education program meets rigorous standards of instructional quality and institutional stability. Six regional agencies award accreditation. These agencies include the Western Association of Colleges and School, the North Central Association of Colleges and Schools, and the Southern Association of Colleges and Schools. Regional accreditation — the gold standard — usually goes to broad-based educational institutions. National accrediting agencies, by contrast, generally specialize in either a specific type of education or a particular program emphasis. Students considering an online bachelor’s degree in accounting should look for both appropriate regional accreditation and approval by one of three national bodies: the Association to Advance Collegiate Schools of Business (AACSB), the Accreditation Council for Business Schools and Programs (ACBSP), or the International Assembly for Collegiate Business Education (IACBE). The AACSB is the most established and also has the most rigorous standards of the three. The ACBSP emphasizes teaching excellence and research in their accreditation consideration. IACBE primarily considers mission and outcomes in their accreditation process. An online bachelor’s degree in accounting can come cheaply in some circumstances, and digital learners can find further aid opportunities through federal student loans, Pell grants, work-study programs, and scholarships. To get started accruing financial aid, fill out the Federal Application For Student Aid (FAFSA). With this application, officials can determine the amounts and types of federally subsidized loans or U.S. government grants a student may receive. Most colleges and universities also use the FAFSA to determine eligibility for institutional financial aid packages. After completing the FAFSA, students can also research and apply for private or institutional scholarships. Funded by the National Society of Accountants, this scholarship provides funding to chosen applicants who demonstrate academic achievement, leadership aptitude, and financial need. Eligibility Requirements: Student must be hold a minimum 3.0 GPA, be an accounting major, and be a citizen of the U.S. or Canada. Drawing its funding from the Foundation for Financial Services Professionals, this scholarship goes to students pursuing majors in finance, accounting, and other business-related vocations. Eligibility Requirements: U.S. citizens who are pursuing a financial field of study at a two- or four-year institution can apply. This scholarship offered by the Government Finance Officers Association helps fund minority students who are upper level undergraduates pursuing a career in public-sector finance. Eligibility Requirements: Full- or part-time students with an appropriate major and letter of recommendation detailing commitment to the public sector can apply. Supported by the Educational Foundation for Women in Accounting, this scholarship funds a woman who is the primary source of her family’s support and is enrolling as a freshmen in a bachelor’s of accounting program. Eligibility Requirements: To be eligible to acquire and maintain the scholarship, the applicant must have a 3.0 GPA. The Illinois CPA Society funds this scholarship in memory of Dr. Herman J. Neal to aid African-American students. Eligibility Requirements: An African-American junior, senior, or graduate student in accounting at an Illinois university can apply.